Before steelhead were introduced into Lake Ontario and its tributary system in the late 1960’s; rainbow trout were introduced into the Finger Lakes tributary system. Stocking and management established substantial runs by the 1950’s and runs still exist today. There are many tributaries throughout the Finger Lakes region that receive runs of rainbow trout. Grout Brook, Owasco Inlet, Cayuga Inlet, the famed Catherine Creek, Keuka Inlet, also known as Cold Brook, Naples Creek, and Springwater Creek all receive runs. There are also many other tributaries, which receive runs at varying intensities and times. 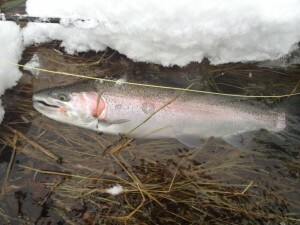 Fish will start to run in the fall and continue to enter the creeks during late winter thawing periods. When water temperatures start to rise, spawning will commence. During warm winters spawning occurs early and some fish are returning to the lake by the time April arrives. Anglers can intercept these early spawning fish in the lower stretches of the creeks as they drop back to the lakes and hold in the deeper pools. Fish returning to the lake after spawning can really turn on and feed ravenously as they need to build energy depleted during the spawn. 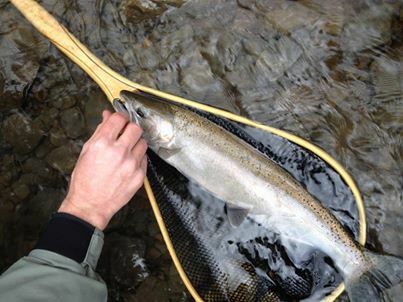 Other years, with a late thaw, they are still arriving on opening day, April 1st for Finger Lakes tributaries, and can often be seen moving upstream or darting up a riffle, long after opening day. With the right timing Finger Lakes tributaries offer excellent opportunities to fly fish for some beautiful Rainbows through April into May. Most range from 2-5 pounds, but some tributaries will draw a few powerful 8-10-pound giants. Many Finger Lakes tributaries are small and are often lined with trees and bushes and long casts are often not a necessity, making roll casting critical. An 8 1/2 to 10 foot, five to seven weight rod and a floating fly line is a good start, combined with some creative casting techniques. One cast used is to use the resistance of the line as it rests straight out on the water downstream. Then, use one hard casting stoke to flick the line upstream a short distance to a target, when nymphing a pool. This technique limits false casts and motion, which can spook fish on smaller tributaries and will also prevent back-casts from snagging in the trees or bushes when not roll casting. Leader length and tippet is determined by water clarity. During high off color water conditions a short leader (7-8 feet) and six-pound tippet is adequate. As the creeks clear, lengthen the leader and reduce tippet diameter. These fish can be leader shy during clear water situations. Four-pound test can help with a natural presentation when fishing a nymph pattern during low clear water conditions. A combination of an eight to 9 foot leader and a three feet of tippet will give sufficient separation between the fly line and fly . Bead head or weighted nymphs help get the fly down. A small split shot on the leader or tag at the tippet can also aid in sinking the fly. I avoid the use of heavy split shot, and like to stick with small sizes, especially during low clear water conditions as losing flies to the river bed can be frustrating. When the rainbows are biting they will rise up to take a drifting nymph or move to take a swinging fly. Coming from the security of a deep lake, these fish are very wary and easily spooked when they move into a small tributary. Angler pressure combined with the natural instincts of fish to avoid predators will drive them into cover, so I always use caution when approaching the creekside keeping an eye out for fish. Good places to find lake run rainbows are, in deep holes, undercut banks, log -jams, around boulders, in plunge pools, or some heavy riffle water with a little depth. Small to medium sized nymphs are one effective way to entice Finger Lakes rainbows into biting. Some good patterns to try are small bead-head nymphs, hare body nymphs, and wet flies. Peacock herl has a natural iridescence and seems to increase the effectiveness of any fly pattern. The Finger Lakes region has excellent opportunities to challenge the fly-fisherman in search of powerful lake-run rainbow trout.